How are you handling the onslaught of screen technology with your kids? 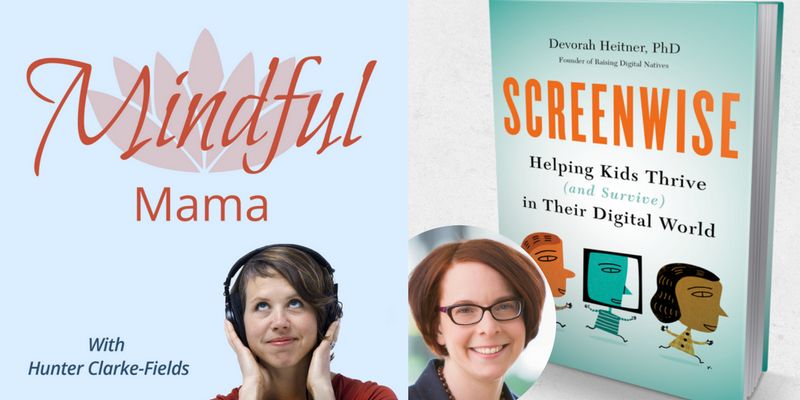 In today’s podcast episode I talk to Devorah Heitner, author of Screenwise: Helping Kids Thrive (and Survive) in Their Digital World. How do you answer these questions with your child? When do they watch a show independently? When do they make their own media choices? When can they do some creating? When to interact with other people? Minecraft with a friend? When should my child get an email account? We discuss all of these big milestones and more. Devorah Heitner Ph.D., is an experienced speaker, workshop leader, and consultant, and a professional development resource for organizations wishing to cultivate a culture of responsible digital citizenship. Her book, Screenwise: Helping Kids Thrive (and Survive) in Their Digital World helps readers become tech-positive parents and educators and gives adults new insights into kids’ digital world. What do you think? How do you handle screentime with your kids? Start the conversation in the comments below. Thank you so much for listening! To support the podcast, please be sure to subscribe and leave a review. It really helps!